On the first third-down of the 2013 regular season for the Colts offense, Andrew Luck looked towards a familiar face to the Oakland Raiders. Facing a third-and-five from the Colts 28-yard line, Luck found wide receiver Darrius Heyward-Bey for a 16-yard gain. The catch came against Raiders first-round pick D.J. Hayden and allowed the Colts to continue their first scoring drive of 2013. Following the win, DHB held court just like he had in the week leading up to the game against his former team. How does it feel to get a win against your old team? “It is always good to get a win in the NFL,” DHB said stone-faced. Take a look at DHB’s emotion following a fourth-quarter completion and there might have been a little extra motivation for the new Colts receiver. 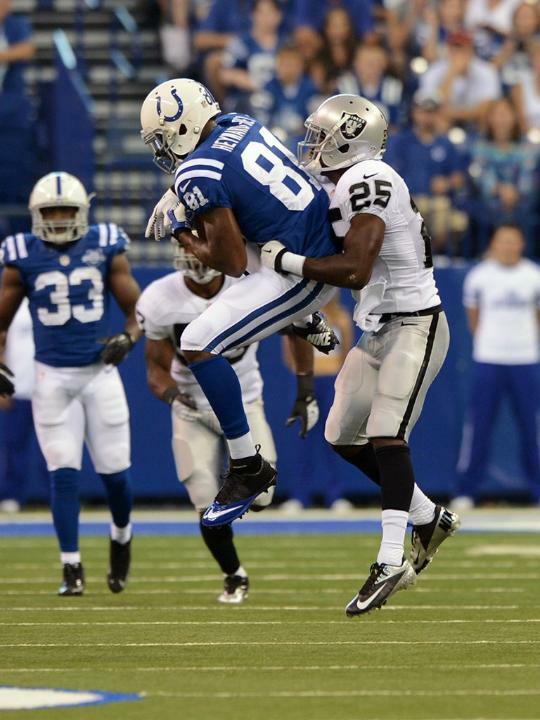 With the Colts down by four points and facing a second-and-10 at the Raiders 49-yard line, Luck once again looked towards DHB. A nine-yard completion would ensue and as DHB fought for extra yards, he earned another 15 yards when Raiders safety Tyvon Branch hit a defenseless receiver in the head. “The play that (DHB) made toward the end stretching, reaching, grinding for a first down and then getting a personal foul penalty was critical,” head coach Chuck Pagano said following the win. The physicality of DHB was on display later in the drive as his “box out” blocking technique allowed for Luck to score the game-winning 19-yard touchdown. “Darrius has been nothing but a great addition to this team,” Luck said after the game. “Football-wise, obviously he’s got the speed. He makes the plays. A big third-down conversion, or second-and-long and he gets it and we get a first down.